Winning the British Formula Three International series title is no guarantee that a successful motorsport career beckons. But judging by previous winners Ayrton Senna and Mika Hakkinen, it seems like a pretty good indicator. Nineteen-year-old Jack Harvey has no plans to rush his development after clinching the title in a thrilling season-finale at Donington Park at the weekend. However, despite his tender years, success in an event that has long been regarded as a key stage on the road that leads to Formula One was no overnight achievement. Harvey, from Bassingham near Lincoln, started his journey more than a decade ago. 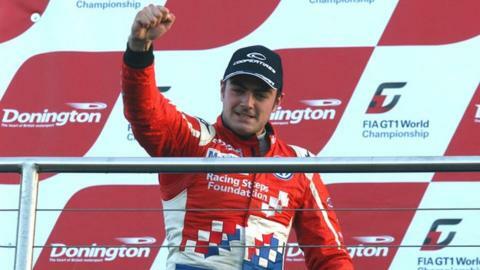 "When I was nine years old my dad bought me a go-kart and we went to our local circuit, PFI near Fulbeck and that was basically how I started, like most people do," he told BBC Radio Lincolnshire. "I had a good karting career and moved through the ranks, my personal highlight being British, Italian and European champion all at the same time. "At that point we as a family decided to try and push to make a career in motorsport rather than a hobby. I can't thank my parents and my sister enough because from quite early on they dedicated a lot of their time to me and my racing." After winning the Asia-Pacific title and finishing European series runner-up in the KF2 class Harvey's step up to single-seaters came in 2009 with funding from the Racing Steps Foundation who to this day remain his biggest backers. "It was just a case of waiting for the right opportunity to come," he said. "I was very lucky in that the Racing Steps Foundation wanted to put me in Formula BMW Europe. That was exactly what I wanted to do and they were the people who wanted to do it with me. "I'm still supported by them and I guess the biggest thanks should go to Graham Sharp and Derek Walters who run Racing Steps. Their support has been incredible. "All the success that I've had in the last few years and will hopefully have in the future is down to them believing in me and being a position to financially support me." In his second and final season in Formula BMW Harvey came close to winning the title, leading the championship right up to the final round before moving to the British Formula Three International Series with Carlin Racing in 2011. He took his maiden victory at the Nurburgring before making a concerted push for the 2012 title which was not without its difficulties, but which ultimately saw him see off the challenges of Carlin team-mate Jazeman Jaafar and Fortec's Felix Serralles. "The penultimate round at Silverstone was pretty bad," admitted Harvey. "But I went to Donington feeling no pressure. I was third in the championship and although the points were close I didn't feel any pressure, even for the final race because it was always clear what I had to do to win. The target was to get a double pole position and two race wins and we achieved that." And he was surprised by the level of support at the final round at Donington. "I didn't realise how much support was out there," he said. "I said to my mechanics that whatever happened in the final race I felt like I was the people's champion, I was almost overwhelmed by so much support." Harvey's ultimate goal is to race in Formula One but he fears that dream could be taken away from him because of finances. "It's clear that to make it you need more than just talent," he said. "You need a big budget too. I'm really hoping that things change otherwise I worry that it will be extremely difficult to get there." After clinching the title Harvey has already turned his attention to the future, with a first outing at the prestigious Macau Grand Prix in November. "I'm massively excited to be competing and to go there as British Champion is a good thing," he said. "We can take confidence into it but it's so difficult. I'm just looking to go and enjoy it and do a good job, which for my first year could be just finishing in the top five." But Macau could be Harvey's final F3 race, as he says his racing career could lie elsewhere. He said: "Racing Steps have said they'll back me next season which is the most important thing, but I doubt I'll be in Formula Three because we've shown that we can compete and win at this level. "One option could be GP3 which would be a good step up and a return to supporting Formula One on European race weekends. There's also the World Series by Renault, there are a few options. "No decision's yet been made but I'm happy to let Racing Steps be responsible for making the decision because so far they haven't done anything wrong in my career."